Maintenance agreements may not be the right choice for every organization or piece of equipment. If your organization prefers to take the burden on themselves and pay out of pocket as repairs are needed to their equipment, Case Financial can help! Our Time & Materials Service features the same great service technicians that over 1000 clients nationwide have come to expect from Case Financial but without the upfront cost of an annual maintenance agreement. The Goal: Pay equipment repairs out of pocket and only as needed. 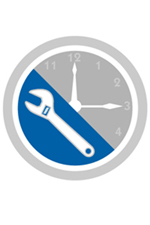 The Solution: Case Financial Time & Materials Maintenance. Please visit our Contact page to request more information about Time & Materials.